At the beginning of July I posted on my tumblr about a situation that arose due to a photo of me that was photoshopped and published in a local magazine. 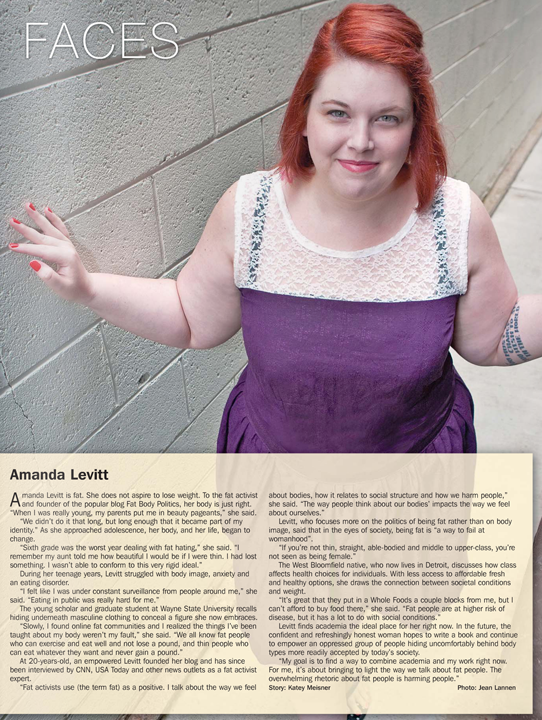 This article was published in a local magazine this month and it took me a minute to realize that the photo had been photoshopped to hide the fact that I’m wearing a crop top. While I was at the shoot the photographer kept asking me to pull the shirt down because they thought the 1 inch of skin showing would distract people from my face. 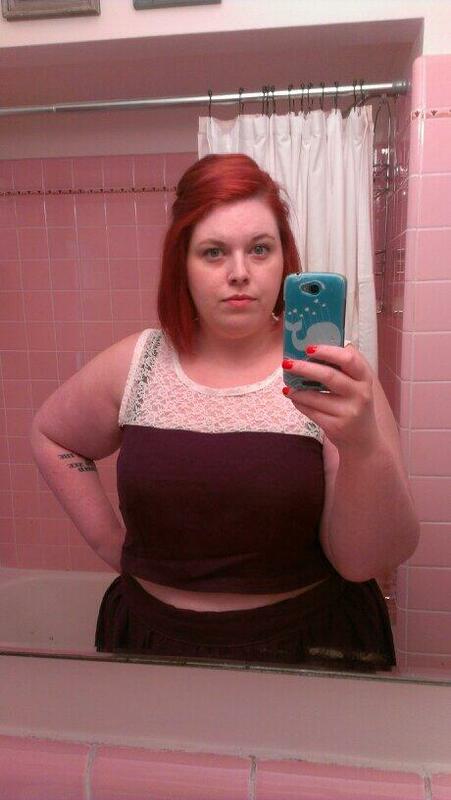 Fat crop tops are not necessary but I think it’s important to note how the prevalence of fat phobia made the writer of the article, who I think was fantastic, not even notice or think about checking to make sure the photo wasn’t photoshopped. Bottom photo was taken the same day. Clearly my stomach is going to ruin the world. I called it #croptopgate and tweeted along with the tag #mybeautifulbody, which was created by a follower on twitter who wanted to respond to what happened to me in their own way. There was some push back against the use of the second tag but I’m also very aware of how people are at different stages in their own deconstructing of fat stigma and self hatred. Being able to call yourself beautiful when you have spent your whole life thinking you aren’t can be revolutionary. Below is the letter to the editor I finally sent today. I’ve been taking a break from writing and that meant not getting this out when I wanted to. In the July 2014 issue of WestEnd Magazine I was featured in the “Faces” section to highlight the work I do to deconstruct fat discrimination and body ideals. While I know for many the issues fat people are forced to navigate in their daily lives is a new concept, I incorrectly believed that the magazine would be more thoughtful in how my photographs were used. My experience being interviewed was incredibly positive but I cannot say the same about the photo shoot or the final image that was used in the magazine. From the beginning of the shoot the photographer made it very clear they were uncomfortable with the outfit I was wearing. I highly doubt that their discomfort would have been the same if I wasn’t a fat woman whose outfit drastically challenged the “rules” assigned as appropriate clothing for fat people. Most fat women are taught from a very early age that we are suppose to hide out bodies and be ashamed of them, thus wearing clothing that covers or diverts attention in an attempt to pretend our bodies simply don’t exist. I thoroughly reject the idea that I need to hide my body and wear clothing that I love regardless of how other people feel. Due to this, I wore an outfit that I made myself – a matching skirt and crop top with a lace upper – for the shoot. On the day of the shoot one of the first things they asked was if I could pull my top down, saying they believed the top would “distract from my face.” Their comment may seem to be harmless but it is one that I have heard most of my life in other forms. Often fat women are told we have “such a pretty face” making a distinction between what is considered to be beautiful and not. Our bodies are considered to be distractions and my outfit didn’t hide that distraction but instead forced the photographer to look at it. It forced them to be distracted and actually see my fat body. The photo shoot continued without any more comments but when the article was published I wasn’t surprised that the photo they chose not only was taken from an angle to make me look thinner but the outfit I was wearing was photoshopped to look like a dress. This experience has reminded me that while I can control the way I dress and present my body to the world I cannot control the way it is consumed and presented by others. This experience that ended the final photo is a complete disregard of my work and myself as a person. I hope this experience makes the magazine think more thoroughly about the photographers they use and how they communicate with them about the subjects they are profiling. The bodies of marginalized people shouldn’t be presented in a way that makes other people feel comfortable nor should the magazine be completely unaware that a photo was digitally altered as was done in my case. We should have the autonomy to decide how our bodies exist in and out of print. Scholar. Writer. Activist. Unapologetic Fat Lady. As always, connect with me on tumblr and twitter. This entry was posted in Fat Rights, Work and tagged body image, crop top, fat, fat activism, fat hatred, fat politics, fat stigma, photographer, photoshop, photoshopped, westend by fatbodypolitics. Bookmark the permalink. First, I love your crop top outfit! Second, I LOVE that letter to the editor!! !